It has held onto its British heritage to the point that it is nicknamed "Little England". British is the main one - and traditions like afternoon tea and cricket matches are firmly entrenched. The African heritage is also evident in many forms, including food and festivals. Because Barbados sits in the far southern Caribbean, few hurricanes strike it. The island is triangular, creating three coasts. Each has its own character. Many quality beachfront resorts reside here because it has gorgeous white-sand beaches and it is located on the leeward (non-windy) side of the island. Bridgetown, Barbados' main city, is at the southern end of the West Coast. The cliffy and rocky seascape is stunning, but it can be quite windy. 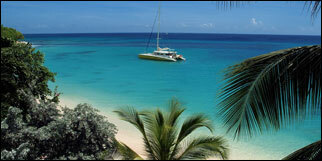 It lacks great swimming beaches but has many first-rate diving and snorkeling sites. This well-populated Barbados region has resorts and beaches, but not as classy as found on the West Coast. Nightlife is lively. Seascape photo is the property of the Barbados Tourism Authority-UK and is used with permission.